As a student of American History, I find it fascinating to learn from key figures who have shaped our nation over the past almost 250 years. Reading about FDR, Lincoln, Teddy Roosevelt, Reagan, Kennedy, Jefferson, and Jackson is intriguing and each one has many admirable qualities. Each has shaped the nation based on the circumstances presented before them. There is one who set the precedent for all of them, though: George Washington. Washington today is often seen as a mythical yet distant figure since we get to stare at his face on the one dollar bill, quarter, and other official government documents. But we would be doing a disservice to him if we didn’t understand what separated him from other leaders. George Washington was an admirable man because of his excellent leadership qualities but what separated him from most was his humility. Even at the height of his power, Washington set the tone for what being the leader of the President of the United States of America meant. In Europe at the time, the highest power in a nation was typically monarchial. Washington saw his position as a public servant. Although the power of the Presidency has ebbed and flowed over the past two centuries, what echoes most loudly is Washington’s humility. Indeed, his humility was as much, perhaps even more so, a part of his greatness. Here are 5 ways we can learn from Washington’s humility. Reluctance for Power: In 1783 when the war ended, Washington went back to his plantation in Virginia as a farmer. Five years later, he was quite pleased with his life, even despite the war’s fanfare. But he recognized that people needed him and he gave up a very comfortable life to come back to lead the nation in its infancy. It is easy to desire power but it must be at the right time and place and unless we are rooted in humility like Washington, we will fail. Limited Service: Washington only served two terms in office. He saw the position as temporary and realized that the position was more important than his name. Presidents for the most part have followed his example since then. Our time on earth is short so it is important to always look at how we are training the next level of leaders to follow us. A Man of the People: He dressed in civilian clothes as President. He was encouraged by some to wear his military uniform but he felt it would look too much like a military dictatorship and like most of Europe’s leadership. No matter our roles in life, we must always treat others with respect and dignity like Washington. The Name of the President: He refused to be called a monarch or a more eloquent name like “His Majesty”, despite what John Adams and Alexander Hamilton wanted. He simply wanted to be called “Mr. President”. 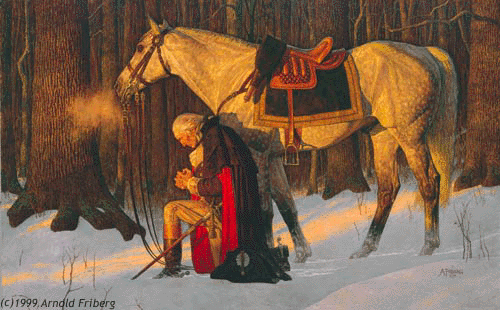 Washington was a man of deep Christian faith and was known to be in prayer often recognizing God’s power over his role. People follow courage and humility, not just titles. Lead in the Hard Times: In the winter of 1777-78, Washington’s camp was at Valley Forge, Pennsylvania. During this incredibly harsh winter, Washington was found to consistently walk through the camp to encourage and engage with his troops. He was never afraid to lead with them and not from behind. Last, I found this story (more myth but the spirit is true) about Washington that reveals a lot about his servant leadership. To learn more about George Washington, I recommend you to read a fascinating narrative of his life, “His Excellency” by Joseph J. Ellis.